Swamp coolers are evaporative coolers. They are air conditioners used in areas with low humidity. Swamp coolers are so named because they inject moisture into the spaces they cool. Evaporative coolers work by pulling outside air through mats that are saturated with water. This evaporation cools the air to a more comfortable temperature for a fraction of the cost of standard air-conditioning. These coolers use a reservoir in the bottom from which water is pumped to the top to drain through the mats to keep them wet. A float in the reservoir keeps the reservoir full of water. 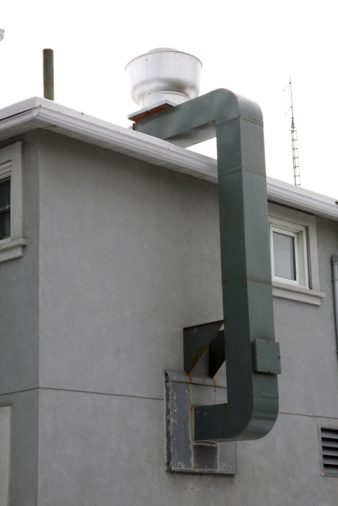 This is a roof-mounted swamp cooler with ducts. Find a source for water as close as possible to the swamp cooler. Fittings are sold to convert outside faucets so that a hose can be put on one side and the line to the cooler on the other. This type of configuration makes the simplest method of hooking up the cooler when it is practical. If such a source is unavailable, locate a cold water pipe nearby. Use a saddle valve like the type employed for connecting ice-makers on refrigerators to tap into a water line. These valves are designed to be clamped onto the water line. You twist the valve down until a small knife inside pierces the water line. Unscrew the valve a little to make sure that water comes out and then shut it off until the connection is completed. Attach the end of the plastic water tubing to the swamp cooler. There should be a fitting along the bottom edge for this connection. Always consult the manufacturer's instructions if they are available for this connection. This tubing will use a pressure coupling. You will have to slide a screw cap onto the tubing followed by a small metal ring. Insert the end of the tubing into the fitting on the swamp cooler. Use a wrench to tighten the fitting until it is snug. Anchor the tubing to the wall of the house with the type of staples that you drive in with a hammer if you must run the tubing for more than a few feet. Be careful not to drive these staples too deeply and damage the tubing. Follow a path that hides the tubing as much as possible. Connect the other end of the water tubing to either the fitting on the outdoor faucet or the saddle valve depending on the one you are using for your water source. Either type of connection will require the same steps as the connection to the swamp cooler. Turn on the water and check for leaks. Tighten any fitting that leaks until it stops. Make sure that the float in the swamp cooler stops the water flowing in at a lower point an inch or so below the bottom of the reservoir. This will give it room to add water after the pump has removed some water to run the cooler without water overflowing when the cooler is shut down. What Is a Water Manifold?